Last Updated: February 16, 2016 | Subscribe to our weekly newsletter! You wake up in the morning, stretch and then look out at your beautiful, crystal clear water pool. Uh Oh. What is that yellowish tinge floating in the water? You guessed it. That’s pollen. Pollen is just a part of life, and like anyone who has to deal with allergies, pool owners must take a few extra steps to fight off pollen in their pools, especially during those heavier pollen times during the spring and summer months. Luckily, getting rid of that pollen is actually quite easy and won’t take that long, either. Just follow the steps below and you can rid your pool of that unsightly pollen so you can enjoy a swim that is clear and blue and now dusty and yellowy. This is something that every pool owner should know. While it differs everywhere, you can get an idea of when it is heaviest in your area if you simply watch the pollen counts. Now, if you are allergic to pollen, you already know this. But it is something every pool owner should be aware of, as well. Watch the pollen counts closely and when they rise be prepared to do a little extra work on your pool to make sure it stays clean and clear. Before you begin your cleaning process, you need to first make sure that what you are dealing with is, in fact, pollen. There are some varieties of algae out there that look a whole lot like pollen. For example, yellow mustard algae has that light yellowish/green look just like pollen. The difference, you will find, is where it collects. Remember, pollen will float on the top of the pool. Algae, on the other hand, will often stick to the sides and even the bottom of the pool and won’t be easily filtered by your pool’s filtration system. If it is floating at the top of the pool, and you notice that some is picked up by your pool’s filtration system, chances are you have a pollen problem. Now that we have established that you indeed have a pollen issue in your pool, let’s take a look at what you need to do to get rid of it. First, just let me tell you that getting rid of the pollen isn’t too difficult, but it’s something you’ll have to work on every day, especially during the heavy pollen times of the year. 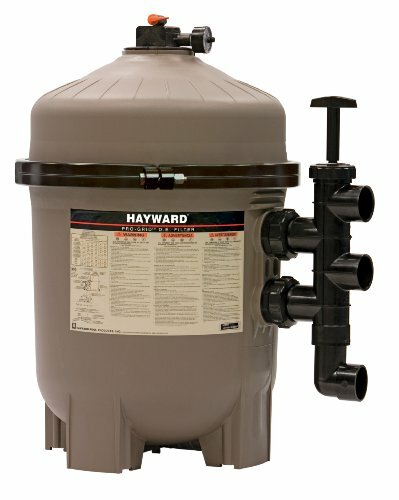 Most pool owners don’t keep their pool filter If you click this link and make a purchase, we earn a commission at no additional cost to you. running 24 hours a day, 7 days a week. However, if you have a pollen problem, then your pool’s filtration system is your best defense against pollen accumulating at the top of your pool. While this may not be enough, this is the perfect first step that you should take in battling your pollen problems. At the very least it will reduce the amount of manually labor you have to perform to get rid of that pollen in your pool every day. While it will cause your energy bills to rise, in the end having a clean pool with less pollen that you have to get rid of yourself makes it well worth it. 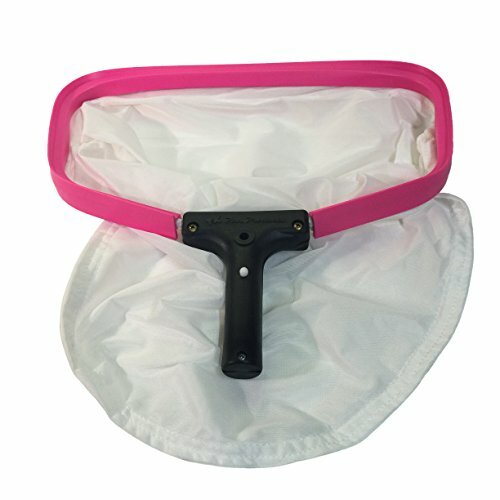 Every morning (and maybe in the afternoon, too) take a skimmer with a very fine mesh head If you click this link and make a purchase, we earn a commission at no additional cost to you. attached to it and run it through the water to pick up any pollen that has collected there overnight. You may have to repeat this process more than once a day during the heavy pollen times in your area. Remember, a regular skimmer net If you click this link and make a purchase, we earn a commission at no additional cost to you. won’t do the trick, you need a special attachment with very fine mesh in order to trap the pollen. Some pollen in your pool is simply too small for you to be able to pick it up and it will even pass through your filtration system like it wasn’t even there. 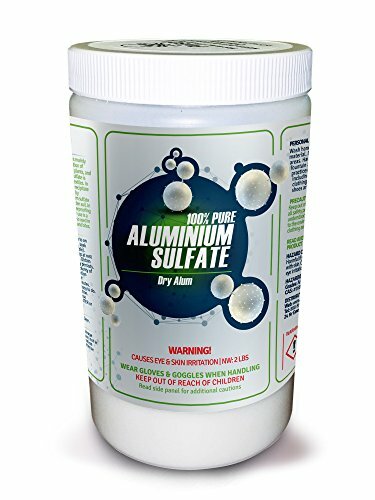 To get rid of this pollen, add aluminum sulfate If you click this link and make a purchase, we earn a commission at no additional cost to you. to your water. This will bind with the pollen causing it to clump together making it easier for either your pool’s filtration system to remove it. 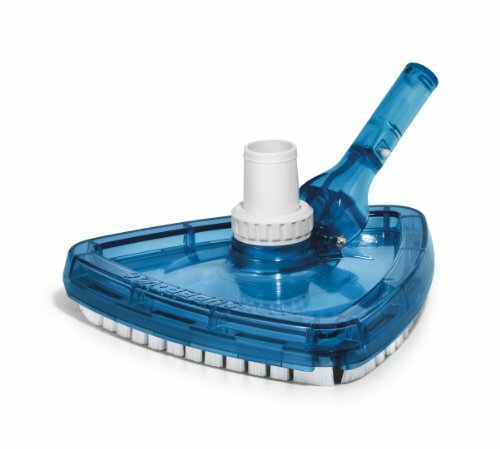 At the same time it will make it easier for you to remove it with your skimmer as well, keeping it out of the filter completely. When you are battling pollen, it is a good idea to give the pool a shock If you click this link and make a purchase, we earn a commission at no additional cost to you. before you go to bed one evening. 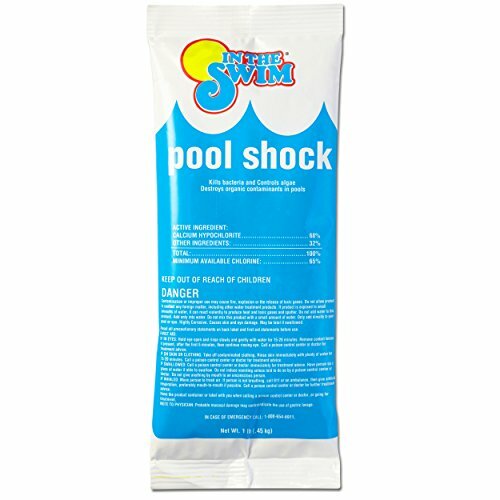 This will kill anything that has decided your pool is a good place to call home simply because of the pollen that is floating around in the water. The next morning, filter the water using your pool’s filtration system and give it another good skim to get rid of anything left over in the water. Sometimes a simple skimming won’t do the trick. If the pollen is especially heavy in your area, you may have to vacuum the pool manually. Use this as a last resort as this will cause both your electric and water bills to go up as you use more electricity to vacuum If you click this link and make a purchase, we earn a commission at no additional cost to you. and remove more water during that process that will have to be replaced. There is nothing worse than looking out at your pool in the morning only to find it covered in a yellowy, floating substance. Pollen, unfortunately, is unavoidable. However, as a pool owner, you want to make sure your pool stays clean and clear. While most of these recommendations won’t take you too long, you will have to do them regularly. So get ready for pollen season and take a few minutes every day to clean your pool so it remains pollen free. Your swimmers, and perhaps your allergies, will thank you. If your swimming pool has nitrates, you need to know how to remove them and put a stop to the contamination before your water becomes a haven for algae. Sanitizer isn't enough to keep algae from invading your pool. Get rid of algae and keep it from coming back so you can enjoy a clean, clear pool again. You remove the pool cover and yikes! It's a green pool! You have an algae problem. Just a few steps and a few chemicals will clear the water in no time. Remove the algae in your salt water pool with aggressive treatment and consistent prevention. Attack that algae today and enjoy your clear pool tomorrow. You've probably heard phosphate remover is essential to pool care. We did some research and the truth is, it's not. Learn why you should save your money. Black algae is perhaps the hardest algae to get rid of. Follow this step-by-step tutorial to help you get rid of black algae in your pool fast.